A former child combatant has gone on trial at Guantanamo Bay, the first detainee to face military justice under President Barack Obama. Canadian citizen Omar Khadr, now 23, is accused of throwing a grenade that killed a US soldier during a gun battle in Afghanistan in 2002, when he was 15. He alleges that he was tortured into confessing to the murder. A UN envoy, Radhika Coomaraswamy, said the trial would set a dangerous precedent for child soldiers worldwide. 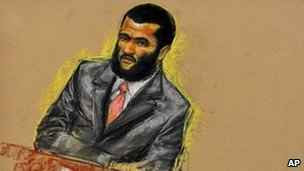 However, the judge said the prosecution must show that Mr Khadr had had intent to commit a crime, and he told jurors they could consider his age in making their decision. Mr Obama had promised to close the controversial detention facility by January this year. Mr Khadr's trial will shine further light on both the camp and Mr Obama's failure to close it, the BBC's Kim Ghattas reports from Washington.